The Pacapod Saunton is now firmly in my possession as my new changing bag, and dare I say it, with it on my back I think I may just be a cool mum. The Pacapod bags have always been my wishlist product when it comes to changing bags. I found myself drawn to them during pregnancy, but never quite managed to check out as I could not justify the price. This was not limited to the Pacapod brand, I lusted over almost every high quality, well designed changing bag brand - and yet, I could never just bring myself to really invest in one that I truly wanted. I've had my Silver Cross changing bag since Harrison was born, and it has been great. Functional is the perfect word. Easily washable, expandable and matched my pram. It done the job, but it lacked style. Put bluntly, I felt like I looked like a right mum when I wore it, and that wasn't necessarily the 'look' I was going for. It was a life-saver in the early days, but as Harrison got older, I kept going back to these £200 changing bags. 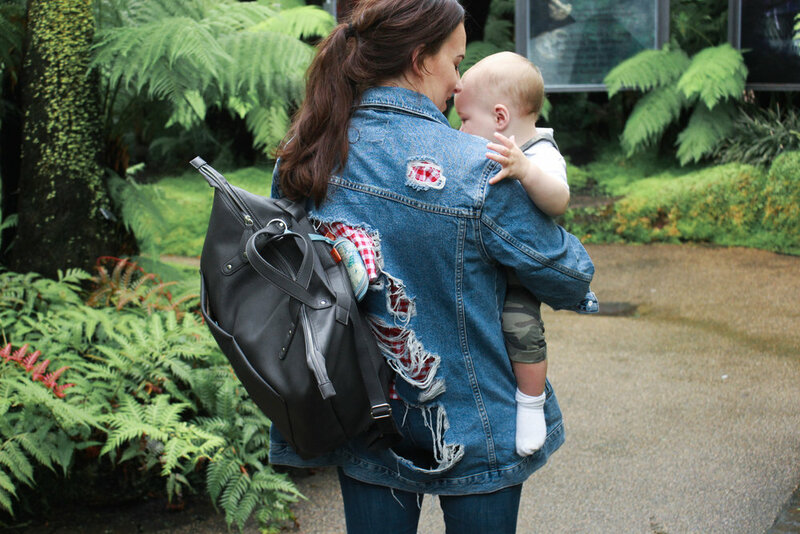 I lusted over these leather changing bags while pregnant, and I don't think Jordan will ever forget the first time I suggested buying one (nor will I ever forget the look on his face). I had almost given up on the prospect of a 'nice' changing bag, accepting the inevitable fate of the Paw Patrol rucksack I'd be carrying around throughout the toddler span. That was until Pacapod recently got in touch to see if I would like to try out one of the bags from the new range: I chose the Saunton Pewter Changing Bag from the Travel Lite Range, and I think I may already be regretting not picking one up sooner. The Pacapod Saunton bag is supposed to 'bring organised elegance to parenting', and rightly so, it does just that. Elegance aside (I'll get back to you with that when I'm not mindlessly crawling after a toddler), it's hard not be more organised with this bag. The whole appeal of a Pacapod bags are the pods that accompany one; my bag has two - an insulated pod for bottles/food, and a second pod for changing. These fit pretty comfortably inside with plenty of room for organised messed to sit below or around, which is perfect for myself. I have no intentions of a squeaky clean changing bag; what I do need is no sudocream leakages, no milk powder explosions and no loose bottle lids that can ruin the entire contents of my bag, and the feeding and changing pods guarantee just that. The bag also comes with a foldable changing mat which is perfect for using on the go, and a mini-pod in the same beautiful map print that clips to the front of the bag easily. This was intended for a dummy, but with a baby that won't touch a dummy, I've found it being my go-to place to store spare coins (or on a very desperate day a Heinz biscotti or two for easy access). The Saunton can be worn either as a regular shoulder bag, or easily using two straps as a backpack. This is ingenious, and the ability to switch between without having to bring extra shoulder straps or handles is so handy with a baby - it's also a bag that is shaped very well for both of these styles. I'd expect a bag that could be worn as a shoulder bag to look oddly shaped or bulky on the back, but Pacapod seem to have struck the right balance between the two. It looks good as a shoulder bag, even better on your back, and I can't help but feel effortlessly cool when I have it slung over one shoulder (I am not cool by any stretch of the imagination, so props to Pacapod for giving me the illusion of it). My one frustration with this bag is that the straps are on a pulley-type-system. Rather than being able to adjust both shoulder straps individually and have them stay at the desired level, if you extend one side, you reduce the other. The reason for this is a smart one, it allows it to pull up and transfer into a shoulder bag as well as a backpack, which I can understand was a calculated design feature, but unfortunately it means wearing the bag on your backpack can be slightly uncomfortable initially until it adjusts back in to place. This means jumping about for a good few minutes until it readjusts, or cutting your losses and sticking to a shoulder bag if you know you'll be taking it on and off. The second 'negative' could be the size - for me, this is no negative, it is far from - but it is large bag. With a new baby, you take everything minus the kitchen sink, with a toddler, you take everything plus the kitchen sink, just in case - so a big bag for me is a god send. For someone who is used to a smaller more compact bag, the Saunton probably isn't the bag to go for. Note: find me a mum who can travel with a baby with a compact bag and I will give you a medal, I need her assistance and I need it now!